Originally published in 1995 Time and Logic examines understanding and application of temporal logic, presented in computational terms. The emphasis in the book is on presenting a broad range of approaches to computational applications. The techniques used will also be applicable in many cases to formalisms beyond temporal logic alone, and it is hoped that adaptation to many different logics of program will be facilitated. Throughout, the authors have kept implementation-orientated solutions in mind. The book begins with an introduction to the basic ideas of temporal logic. 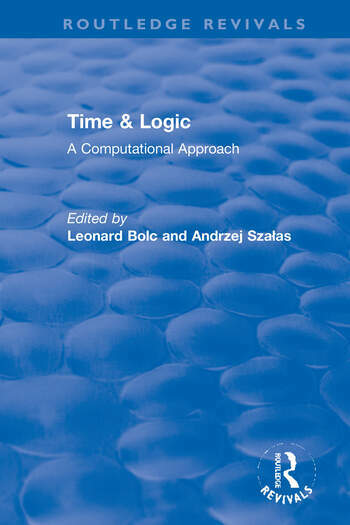 Successive chapters examine particular aspects of the temporal theoretical computing domain, relating their applications to familiar areas of research, such as stochastic process theory, automata theory, established proof systems, model checking, relational logic and classical predicate logic. This is an essential addition to the library of all theoretical computer scientists. It is an authoritative work which will meet the needs both of those familiar with the field and newcomers to it.